The Supplier Management module is used to maintain a master list of approved suppliers. The Supplier Management module can help you satisfy international quality specification requirements to control and evaluate suppliers. Designed specifically to meet all the requirements of a fully functional supplier management system as described by quality standards such as ISO 9001, ISO 13485, AS9100, TS 16949 and SQF 2000 / ISO 22000. Supplier reports can provide a starting point for assessing supplier quality performance. You can record supplier qualification (selection) criteria such as supplier levels, ratings and evaluation frequency along with other criteria including certifications (if applicable) and internal approvals. Supplier control features (levels, ratings and evaluations) are fully configurable to suit the supplier control methods defined in your quality system. PLAN AHEAD – Monitor when supplier quality evaluations are due. LINKED TO NONCONFORMANCE MODULE – Instantly view all nonconformances for vendor-supplied parts. View all current (open) as well as past nonconformances. Track supplier quality performance. 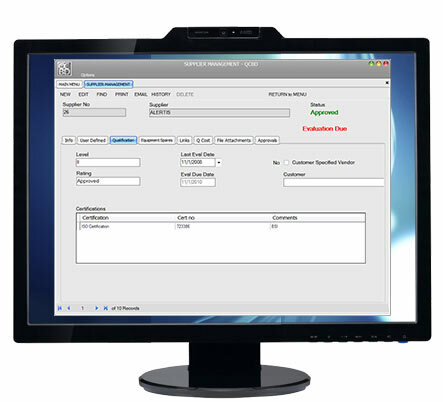 LINKED TO CORRECTIVE ACTION MODULE – Instantly view all vendor-related corrective actions. View all current (open) as well as past vendor corrective action requests.